The Tampa Bay Lightning made a rare move last week when they placed defenceman Jake Dotchin on waivers to terminate his contract after a material breach. TSN Hockey Insider Bob McKenzie shed some light on the situation Wednesday, revealing that Dotchin showed up weighing significantly heavier than his 2017-18 playing weight. "I know that there have been reports out there that suggested his body fat was as high as 25 per cent. I don't know if those numbers are accurate," McKenzie told First Up on TSN 1050 Toronto. "What I can tell you, and what I do believe is accurate, is that he was a good 30 to 35 pounds above his playing weight. So I don't know what percentage body fat he was, but I can tell you that the relative expectations of what the Lightning expect him to play at versus what he showed up as, it was a good 30 pounds." TSN Hockey Insider Bob McKenzie joins Michael Landsberg and Carlo Colaiacovo on First Up to discuss the latest surrounding the remaining un-signed RFAs, including William Nylander, and why Tampa Bay moved on from 24-year old Jake Dotchin. McKenzie noted that teams will often suspend players who show up over weight for camp and wait for them to get in shape. Dotchin is listed by NHL.com as 6-foot-3 and 210 pounds. The 24-year-old appeared in 48 games for the Lightning last season, posting three goals and 11 points. McKenzie said he believes the Lightning had him pencilled in for a top-six role this season before he reported to camp, and added that with a strong preseason he could've paired with Norris Trophy candidate Victor Hedman. The NHL Players’ Association is now involved and the case is headed to an independent arbitrator. 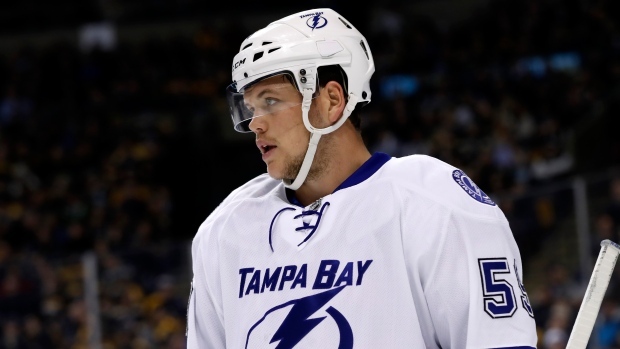 However, McKenzie believes that no matter the outcome, the Lightning will emerge from the situation as winners. "The fact that the Lightning went to the extraordinary step that they did of terminating the contract also indicates to me that there may be more history there, there may be other things that happened along the way that would be in your permanent record, as they used to say at school when you got in trouble, and that this was sort of the breaking point," McKenzie explained. "In any case, now the players’ association is involved and they think it's a precedent case - we gotta be really careful here, if every player who shows up to camp overweight gets his contract terminated, that's not an advantageous situation for the players or the players’ association. "But, if you're the Tampa Bay Lightning, it's a no-lose proposition because the worst that could happen to the Lightning is an independent arbitrator will tell them, 'Nope, sorry, you were not within your rights to terminate his contract because he showed up out of shape.' In which case, they have to take him back. But, in the meantime, what they've done is they've sent an unbelievable message to Dotchin saying, we're not fooling around with you. We tried to fire you for being overweight and the only reason you're back here is because the independent arbitrator ruled in the favour of the PA, not us. It also sends a message to the rest of the players on the Tampa Bay Lightning and maybe a little bit to players in the National Hockey League as well. Dotchin averaged 16:29 of ice time per game in the regular season and did not dress for the team in the postseason. He was entering the final season of a two-year, $1.625 million contract signed with the Lightning last summer and is currently a free agent. The Lightning drafted Dotchin in the sixth round of the 2012 NHL Draft.